Jedi Master Satele Shan streaks through space aboard the sleek Republic Striker-class Starfighter. With attack and cruise mode wing configurations, flick missiles, rear lightsaber storage and T7-O1 droid, this powerful starfighter has everything itneeds to take on the evil Sith Empire. Includes 3 all-new minifigures: Satele Shan, Republic Trooper and T7-O1 Astromech Droid…. 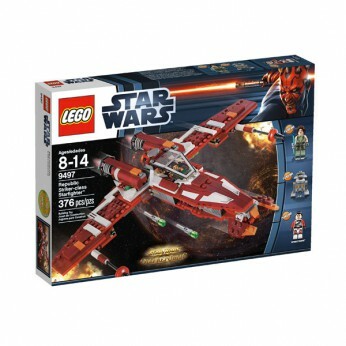 This toy costs approximately £32.99 (for the latest and best prices make sure you check our retailer list for the LEGO Republic Striker-class Starfighter 9497 above). In our review of LEGO Republic Striker-class Starfighter 9497 we classed it as being suitable for ages 6 years, 7 years, 8 years but recommend you check the manufacturer specific advice before purchasing.